The target age group for this book were barely born when 9/11 happened. They missed all the stress (though they live with the aftermath, not having any idea what it was all like before), the tension, the fear. I know C was barely 18 months when the Twin Towers went down, and was blissfully clueless about it all. Even M, who was five, only has a foggy memory of what it was like during those days. Enter Shooting Kabul. 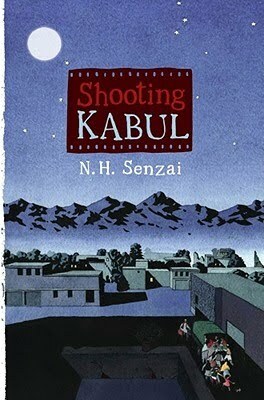 Set in the time right around the attacks, it gives us a peek into what life was like in Afghanistan at that time. Fadi and his family are intellectuals; they had lived in the U.S. while his father got a PhD before returning to Kabul to help the Taliban (yes, you read that right) eradicate the poppy fields and convince farmers to actually plant food to feed the Afghani people. Unfortunately, as the Taliban became more and more extreme, Fadi’s family’s lives were in danger and they managed to escape. Except, in the desperate attempt to get out, somehow the Fadi’s little sister, Miriam, gets separated from the family and lost. Fadi blames himself (as does the rest of the family), and in San Francisco he keeps trying to concoct ways to get back to Afghanistan and find Miriam. It’s heartbreaking to think about the weight this poor boy is carrying around. As weeks and months go by, it seems less and less likely that they will find her. Especially since his father hasn’t been able to take a teaching job, and is forced to drive taxis, which barely covers rent and food. Things are tough, and get tougher with the racism and fear after 9/11. So, Fadi enters a photography contest with the hopes of winning the grand prize — two tickets to India — so he can do his part to find Miriam. First off: it does have a happy ending. Miriam is found, and the way it happens is quite surprising and actually very realistic, which I found wonderfully satisfying. As was the rest of the book; I liked the use of photography, how Fadi stood up to the bullies without using violence, and the glimpse into what the lives of Afghanis are like, both in Agfhanistan and in the U.S. It’s a good book to interest kids in the area, to give them a picture of what life was like nearly 10 years ago (and remind them that things aren’t that different now), and give them a good, engaging story on top of all that.